Journey through centuries of Georgian history where Greeks, Romans, Arabs, Mongols, Persians, Turks, Russians, and the Western world left their marks while the Georgian culture persevered in maintaining its fascinating and unique culture. Stephen Tavella – father, photographer, gardener, yogi, hiker, swimmer, traveler, adventurer, seeker of waterfalls, motorcyclist, sushi-maker, lover of all things natural – is a resident of Dummerston, Vermont, USA. Steve has been exploring and photographing landscapes and cultures from around the world since he spent four years in the Peace Corps in the Republic of Kiribati and Solomon Islands in the 1980's. 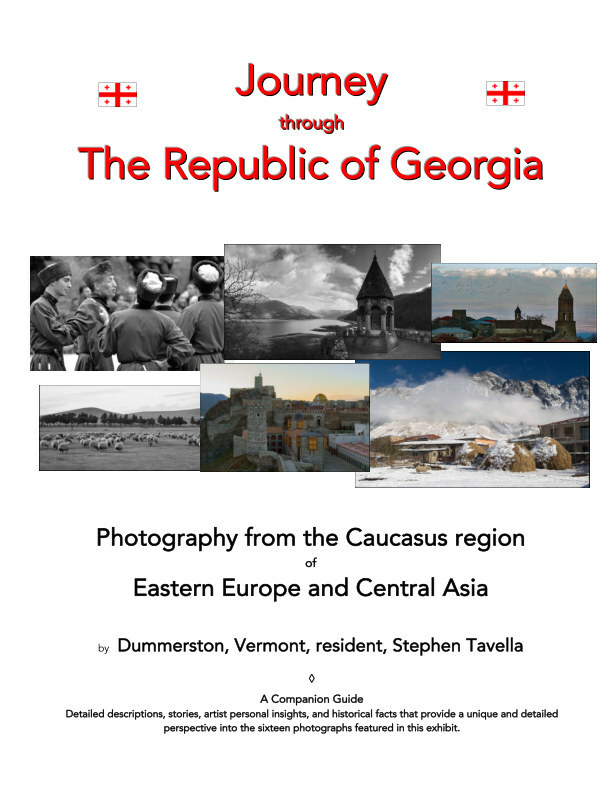 Fifty countries and six continents later, his most recent work and travel has taken him to the Caucasus country of the Republic of Georgia where he worked as a strategic management advisor to a peace center in Tbilisi. Travel throughout New England, the United States and around the world with more of Steve's photography at http://heart-sign.com, or on Instagram at stavella2314.